'Old Man Logan Vol. 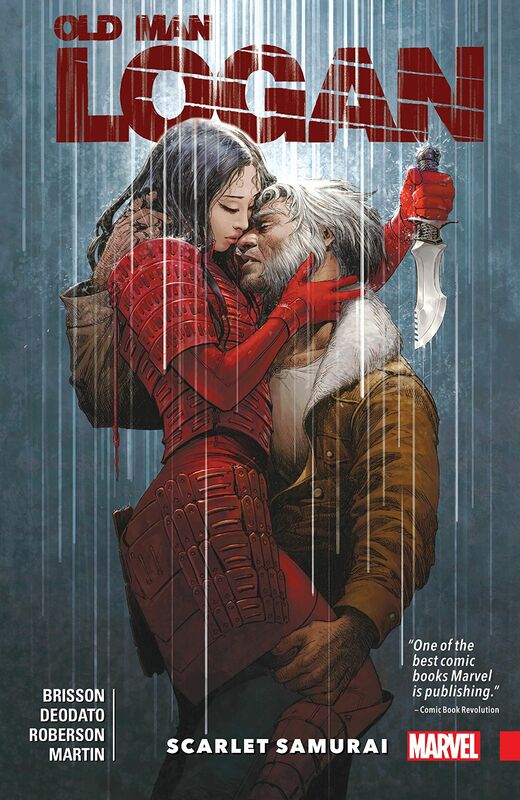 7: Scarlet Samurai' review: An important character from Logan's past returns – AiPT! You get a resurrection! You get a resurrection! You get a resurrection! EVERYBODY GETS A RESURRECTION! No, you didn’t miss a very special episode of The Oprah Winfrey Show, but the way things have been going in the X-Men’s side of the Marvel Universe, you’d think Oprah was dishing out new chances at life. We had Jean Grey, and we had Wolverine and Multiple Man. Oh, and don’t forget that last-page reveal in the most recent issue of Astonishing X-Men. And, if you read Old Man Logan Vol. 7: Scarlet Samurai, you’ll learn that… well, in the event you’ve made it this long unspoiled and want to go into this trade paperback fresh, turn around now. After this picture, we’re diving into spoiler territory… Hey, you’re still here! So, in the latest volume of Old Man Logan’s continuing adventures (collecting issues 31-35), we find the former Wolverine in Japan–where so many of the iconic X-Man’s greatest stories took place. And like those classic tales, this one has ninjas, the Silver Samurai and the Scarlet Samurai (because it never hurts to mix it up). Really, this story is a throwback to classic Wolverine adventures, when the hero would wind up in the wrong place at the wrong time, which makes sense as this was the first Old Man Logan story arc of the Marvel Legacy era. It all kicks off with Logan battling members of the Crazy Thunder Clan, a gang on the regenerating drug known as Regenix. Did you lose an arm while battling a dude with adamantium claws? No problem–when you’re on Regenix! Turns out the drug is being produced by the Yashida Corporation (run by the Silver Samurai) and Gorgon and the horde of the Hand want control of it… which means a hostile takeover of Yashida Corporation. And hilarity ensues! And by hilarity, I of course mean nonstop ninja action. Now, if the name Yoshida sounds familiar, it’s because it’s the last name of one of Logan’s greatest loves — the deceased Mariko Yashida. And here’s where the big spoiler comes into play–the Hand has brought her back as the Scarlet Samurai! As I don’t read Old Man Logan on a monthly basis, I had no idea writer Ed Brisson had done this. It’s pretty bold, in my opinion. I feel like Mariko is up there with the characters you just never bring back, like Uncle Ben or Gwen Stacy. But she’s back now! I guess the rules changed once Ed Brubaker brought back Bucky. Overall, like Brisson’s first Old Man Logan arc, this is a solid story that’s a quick and entertaining read for Wolverine fans waiting for the real deal to return. However, as soon as it was revealed Mariko was back among the living, I was anticipating a more emotional reunion between her and Logan. But perhaps Marvel is saving that for her Logan, once he’s finished with his extremely lengthy return. After all, Old Man Logan has experienced so much more since the Mariko he remembers passed away. I did enjoy Brisson’s take on the resurrected Mariko. Her scarlet armor and skills, combined with her desire to explore this new world she finds herself in makes me hope we’ll see her again soon. Jean’s back, now Mariko–it’s no wonder Logan decided to bust out of that adamantium cocoon! I continue to enjoy Mike Deodato Jr.’s art on this series. His realistic style can be a bit too dour for more traditional superhero stories, but the grounded nature of Old Man Logan’s world is perfect for the artist. But don’t let my use of the word “grounded” make you think there aren’t any spectacular visuals in this trade, because boy are there a bunch! The Silver and Scarlet Samurais’ armors are great, as is the shot of thousands of Hand ninjas climbing the Yashida Corporation tower. In this collection, Deodato Jr. shares art duties with Ibraim Roberson, whose pencils I’d say are a bit cleaner than Deodato Jr.’s sketchier visuals. But as Roberson handles the latter part of the story, the action gets turned up a few notches. That means Roberson gets to draw sword stabbings and decapitations… so many decapitations. If you’re looking for a good action comic, Brisson, Deodato Jr. and Roberson don’t disappoint. As X-Men Blue and Gold prepare to go away, I’m not sure how much longer Old Man Logan has on the shelves, what with the real thing finally back in the Marvel Universe. Until then, this title remains one of Marvel’s most consistently entertaining titles–and that’s coming from someone who was never the biggest fan of Wolverine’s solo titles. My one hope is that, should Logan replace his older self, the work Brisson and Jeff Lemire before him contributed to this title won’t be forgotten. And yes, that includes anything involving the resurrected Mariko. The always-entertaining Old Man Logan offers up an action-packed story that could have long-term ramifications on the real Wolverine's life. And artists Mike Deodato Jr. and Ibraim Roberson know how to draw it! Hopefully this isn't the last time we've seen the Scarlet Samurai. I think I expected more from the return of such an important character. But maybe there's more to come.